As a part of SP Jain Singapore’s Corporate Social Responsibility initiative to help develop and widen the pool of skilled local talents, SP Jain Singapore will provide scholarships and training to MMS’s members. In addition, the MOU also includes initiatives such as entrepreneurial training for female members of MMS and personal effectiveness and leadership workshops. The initiative does not limit to the professional working adults but also the youths of MMS. There will be career counselling for youths and the chance to take part in the "Shadow the Professionals" project. “Shadow the Professionals” allows youths to have first-hand work experiences by spending several hours with a professional who works in their field of interest. Maharashtra Mandal Singapore's President Asmita Tadwalkar commented, “MMS is happy to partner with SP Jain Singapore, an alliance that will bring exciting synergies to the fore. We look forward to the unique collaborative opportunities that will be created along the way. 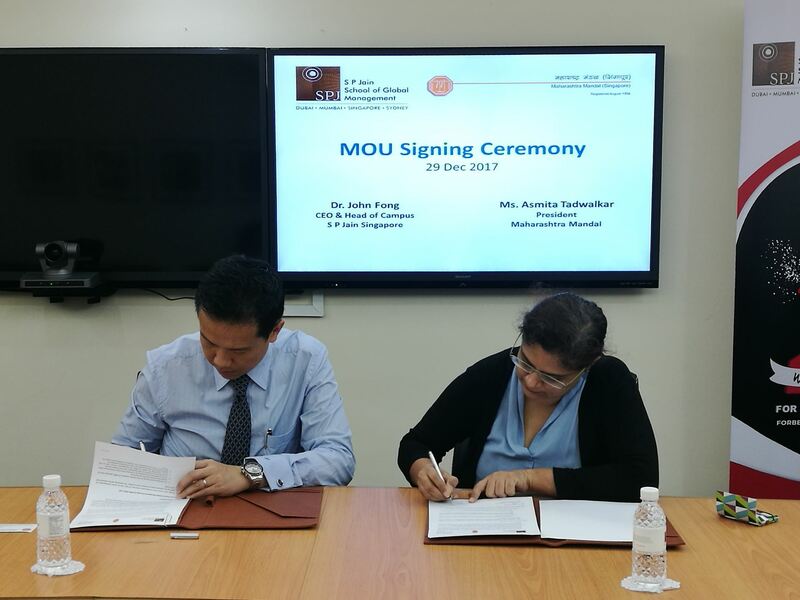 The signing of the MOU took place on Friday 29th of December 2017 at the SP Jain School of Global Management Singapore heritage campus located at 10 Hyderabad Road. S P Jain School of Global Management (SP Jain) is an Australian technology-led business school with campuses in Dubai, Singapore, Sydney and Mumbai. Its full-time students get to live and study in three different cities - Singapore (or Mumbai), Sydney and Dubai where they understand how to evaluate business prospects, take risks and emerge as a true global business leader. In less than 13 years, SP Jain has gained recognition in reputable publications. Their programs have been ranked by Forbes, The Economist and the Financial Times just to name a few. Visit http://www.spjain.sg to find out more.